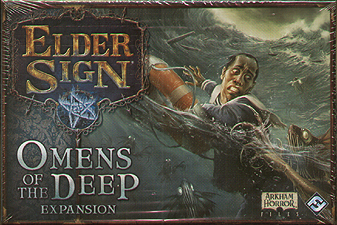 Enhance your games of Elder Sign with the R'lyeh Rising game mode in Omens of the Deep! Investigators sail the Pacific Ocean and uncover the ancient mysteries that lie within its depths while evading an army of Deep Ones that are tying to destroy the ship. During their adventures, investigators must find the pieces of a broken amulet that will lead them to the corpse-city of R'lyeh and the terrors it holds. This expansion introduces powerful missions, as well as new items, spells, skills, and an entourage of useful new allies. Batten down the hatches and prepare to sail the deep!